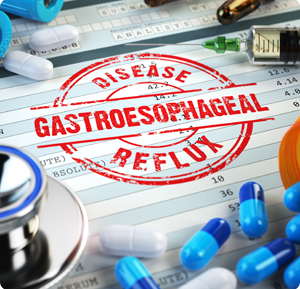 If you are suffering from gastroesophageal reflux disease (GERD), your doctor at North Shore Gastroenterology may want to use a Bravo capsule to determine the amount of stomach acid that comes back into your esophagus (pH level) and the length of time you experience acid reflux during your normal activities. Bravo pH monitoring takes place over a 48-hour period to track what happens in your esophagus as you eat, digest, and go about your daily activities. The Bravo capsule is placed during an upper endoscopy procedure. You will receive a local anesthetic to numb your throat while the doctor uses an endoscope (flexible tube) to view the inside of your esophagus on a video monitor. The doctor attaches a small capsule on the wall of your esophagus to measure the amount of acid reflux present, and the information is sent to a receiver you wear on your waistband or belt. For the next two days, you will record information into a diary provided to you including all the symptoms you have (coughing, heartburn, belching food into your mouth), the medications you take, what you eat and drink and at what time, and when you lie down. You will return the receiver and your diary to your doctor during a follow-up appointment. The data gets downloaded to a computer program, which generates a comprehensive report for your doctor to analyze. The Bravo capsule will fall off the wall of your esophagus and pass through your system until it is discharged during a bowel movement. Do you have acid reflux? Don’t delay treatment any longer. Contact North Shore Gastroenterology to schedule a consultation with one of our GI doctors in in Westlake and Brooklyn, Ohio. Call (440) 808-1212 or use our convenient online appointment request form.